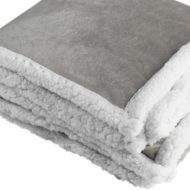 Wrapping up with luxurious and cozy Sherpa Blanket is the perfect way to relax! Its soft fleece face and a plush sherpa-like back offer a superior level of comfort. This product makes an excellent gift!